Buttercup was living under a trailer with her 3 kittens, trying to protect them from the elements and predators, when a kind human took her in and brought her to us. As you can see, she is gorgeous, with a personality to match her good looks. She loves her kids, but loves people too. Will play and romp or settle in for a snuggle with you. Cleo arrived at our shelter in May 2008 as a one year old with her litter of newborns. She is a bob-tail, a little shy and will dart away if you approach her too fast. Once she gets to know you, she loves her strokes and will sit and purr all the while. Cute fluffy Alondra is just over a year old. She's a long hair tabby mix and couldn't be a sweeter mom. She is always ready to cuddle and take a nap on the first blanket she can find. Astra is a staff favorite! She's a black and white shorthair who is 3 years old. She's slightly round, which just adds to her allure. She purrs every time someone pets her. Click "Read more.." to read about all our 22 mom cats! Please support our shelter animals on September 18th from 6:00 a.m. until midnight. Mark Your Calendar!!! North Texas Giving Day is just around the corner, September 18th from 6:00 a.m. until midnight. It is the largest single donation day in North Texas and we are hoping your donation will support our shelter. 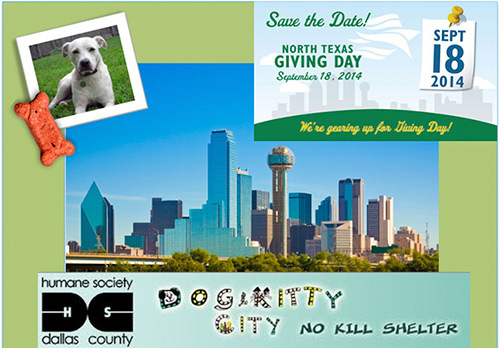 Please go to www.northtexasgivingday.org/#npo/humane-society-of-dallas-county-dog-kitty-city and give generously. Please help us help the animals!!! 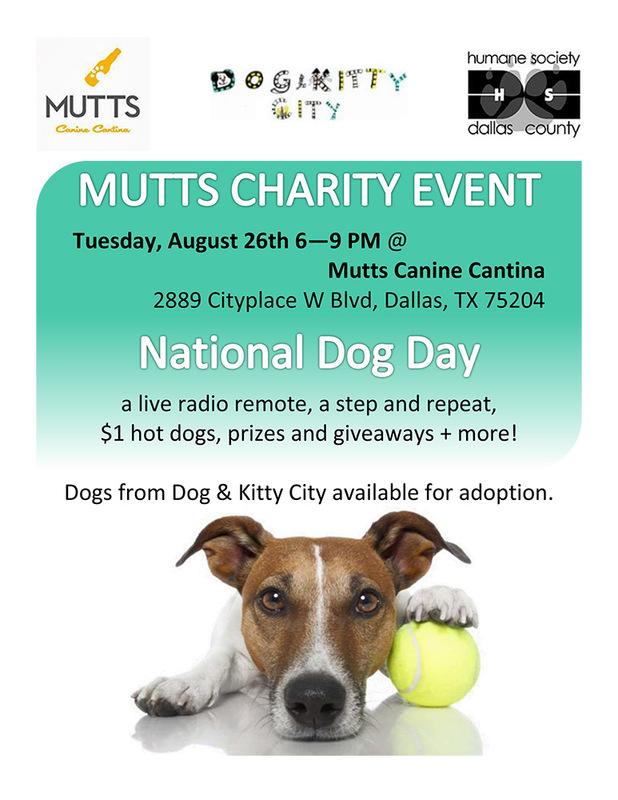 Mutts Canine Cantina hosted a DKC adoption event on August 26th, National Dog Day. Volunteers and pups had a fantastic time. We are so grateful to our friends at Mutts!!! RAW by Canines First heard about the Mutts' promotion and came by to donate $200 worth of food for our canine friends. 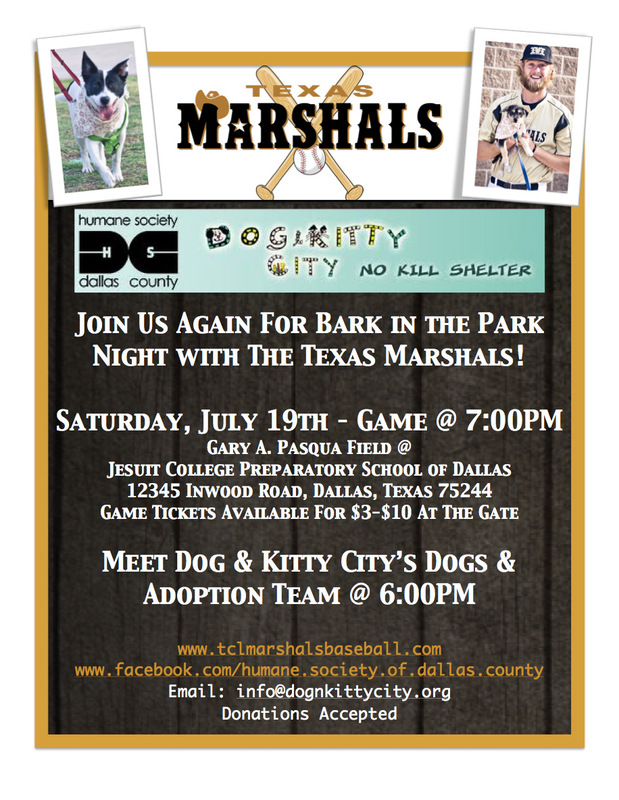 Thanks Texas Marshals Baseball team for hosting Humane Society Dallas County/Dog & Kitty City for Bark in the Park July 19th! We had a blast! Join us ONE MORE TIME - Sunday July 27th for this season's last Bark in the Park Night with the Texas Marshals at Jesuit College Prep School's Gary A. Pasqua Field. Our adoption team will be on-site starting at 6pm, first pitch is at 7pm. Texas Marshals game tickets are $3-10 at the gate. You'll meet our great adoption team, 10 gorgeous dogs and enjoy some fantastic baseball. Go Texas Marshals! Join us once again for "Bark in the Park" with the Texas Marshals Saturday, July 19th at Jesuit College Prep School's Gary A. Pasqua Field. Game time is 7 pm. Meet HSDC/Dog & Kitty City's dogs and adoption team starting at 6 pm. Texas Marshals baseball tickets are $3-10 at the gate. Starting June 1st, Humane Society Dallas County/Dog & Kitty City has been selected as a non-profit to be featured on the GlobalGiving June Open Challenge. GlobalGiving connects individual and corporate donors with worthy non-profits around the world who are making an impact through advocacy and community efforts. We are one of 330 non-profits selected and one of 9 dedicated to animal advocacy. Our shelter's efforts to care for abandoned dogs and cats will be a highlighted project. If our project raises $5,000 from at least 40 different donors between June 1st-30th 2014 on GlobalGiving, our project will be featured throughout 2014. On June 11th and 18th, GlobalGiving will match all online donations at 15% until their matching funds reach $5,000. Online donations will be accepted through June 30, 2014 until 11:59PM EST. Check donations also count towards this challenge if received no later than June 26, 2014. All checks for the GlobalGiving June Open Challenge must be mailed to: GlobalGiving, Attn: Project #17389 HSDC-DKC, 1110 Vermont Ave NW, Suite 550 Washington DC 20005 in order to be counted. With this challenge, we have a chance to raise $10,000 to help the dogs and cats currently in our care! With your help we are making a difference in saving abandoned animals, finding them great forever homes and providing a safe caring environment for those still awaiting adoption.